A teenager from Derbyshire, who has just reached voting age, is aiming to become the youngest UK MP. Luke Wilkins, from Long Eaton, who turned 18 on 31 March, is planning to stand as an independent candidate for Erewash at the next election. The Derby business studies student said he hoped to encourage more young people to vote and get involved in politics by standing himself. He said it had been his ambition to stand for election for a long time. Mr Wilkins said: "This is not something I've looked at over the last month. "I've been thinking about this for a long time - I've been saving my money and sorting out my election campaign over the last couple of months. "Young people need a role model. If I can stand as an MP - who says that young people can't do whatever?" Conservative candidate Jessica Lee said: "I think it's good to see a young person enthusiastic to get involved in politics. "I look forward to seeing him out on the campaign trail." 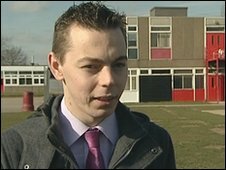 Liberal Democrat candidate Martin Garnett said: "Anything that's going to encourage young voters is a good thing. "The Liberal Democrats have an active system to encourage young voters. It is so difficult to get young people to realise that politics is relevant to them." Labour candidate Cheryl Pidgeon said: "It is great to see someone so young standing as a candidate in the general election. "The decisions that politicians make affect everybody regardless of age, therefore we need to encourage more young people to take a keen interest in politics and I wish him all the best in this year's election."